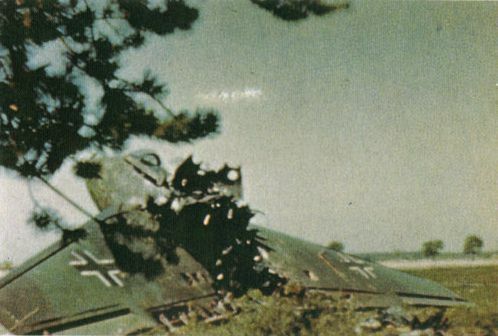 Airfoil caption: This Me 163B 'Komet' was discovered destroyed at Polenz, a dispersal area for Brandis airfield. The wings are finished in the late war scheme of Braunviolett (Brown-Violet) 81 and Dunkelgrun (Dark-Green) 82. Note that the Brown-Violet 81 assumes the brownish-violet cast that its name implies, just as the 82 is in fact dark green! The wing camouflage has been allies in a soft-edged splinter. The upper wing Balkenkreuze are the older black and white style, a not uncommon occurrence on these craft. The undersurface color is most likely Lichtblau (Light Blue) 76 under some of the exposed panel edges, traces of red-oxide primer can be seen. This photo is one of the very few that shows the pattern of the wing camouflage. Personnaly I have my doubts whether we are seeing 81 and 82 here (or 81 and 83 if you use current-day identification). I just don't see the violett cast, just the brownish. Could it possibly be 70 and 71? After an extensive discussion with Andre 'Rammjäger', we can now pinpoint the approximate location of this photograph. It was made at the south-east side of Brandis, at the edge of the wood, looking towards the runway. The main identification point are the trees in the background. They are apple tree standing beside the road from Polenz to Leulitz. The wood itself consists of 'Kiefern', as can be seen hanging in front of the Komet. Snown below is a cut-out of the map shown on the Brandis page.